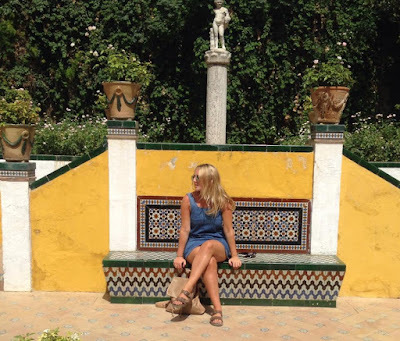 It's a bit of a shock to the system come September when the temperature well and truly drops, umbrellas become a handbag necessity and holidays seem a thing of the past. Summer is undoubtedly my favourite season, when the sun naturally bleaches your hair and you can get away with the no make-up look simply with a tinted moisturizer and a pair of sunglasses. This can't really be said of autumn, so stepping up your beauty routine can make all the difference in maintaining a summer glow. If you have been soaking up the sun over the summer, skin can become more dry and scaly than usual due to the lack of moisture, and if you're not moisturising daily then any tan you have fought to keep fades twice as quick. A means of battling both of these autumn-induced issues is a fake tan that acts as a moisturizer. I only really use gradual tans as you can build the shade up as much as you want, and as I find sprays and mousses can be drying, gradual moisturisers are my go-to. 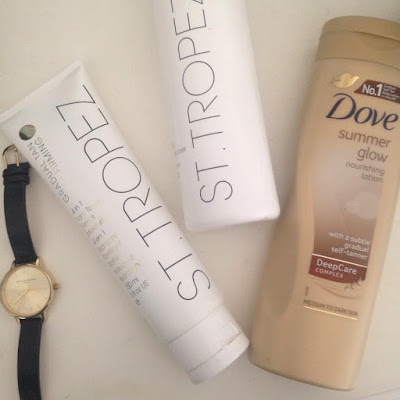 The St Tropez Gradual Tan Firming Plus 4 in 1 is a product that I started using in Spring, drawn in by the promise of a tan that does everything. The shade is subtle but natural, and builds brilliantly upon any tan that you previously have. There is also a St Tropez Multi-Action Face which has similar properties but with a much lighter texture. If you'd rather not use a fake tan on your face, the Clarins Radiance Plus Golden Glow Booster is a product I have recently been raving about and I often use to balance out my face and body. It only requires a few drops in your choice of face cream or serum. Maintaining a tan in the autumn can feel rather futile and wasteful if you spend all your time covered up in jeans and over-sized jumpers but the beauty of gradual tan is that you can pick and choose how often you use it. 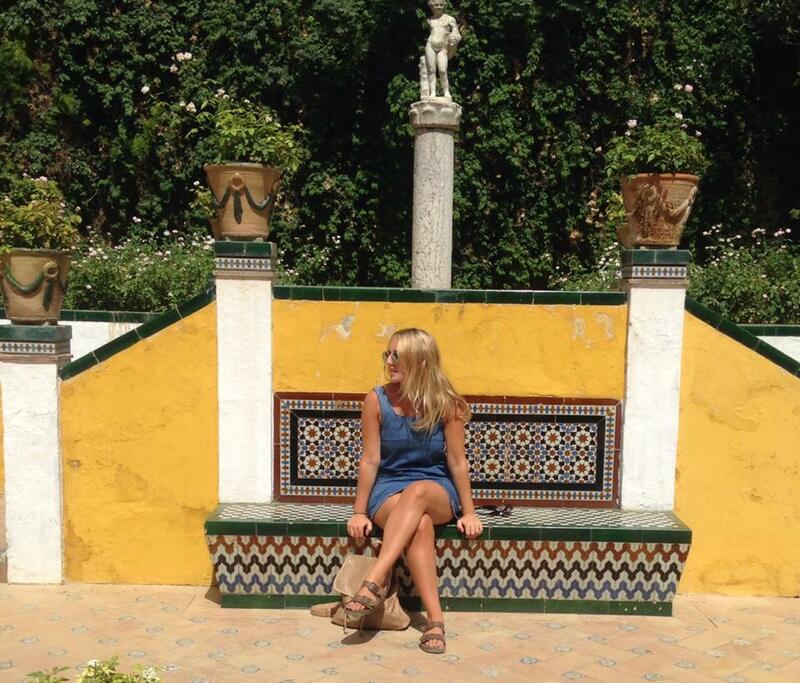 I also like using the Dove Summer Glow Nourishing Lotion; a cheap alternative to St Tropez. I often choose the darkest shade of tan even though my skin is very fair as it lasts a lot longer and you don't have to use as much (hence better value) but this runs the risks of streaks. Moisturising your elbows and knees before application should help with this. When you have to resort back to your lightest foundation is when you know the tan has finally faded, and this is the moment bronzer becomes your best friend. 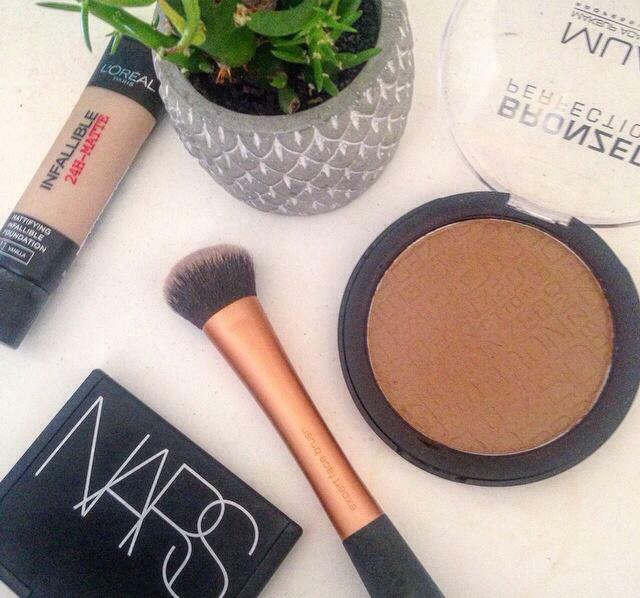 The Nars bronzer in the shade Laguna is my favourite bronzer to use all year round. The shade looks dark in the palette, but is subtle and easy to build up as much as you want on the parts of your face that the sun would naturally hit (cheekbones, forehead, nose and chin). It is great at building up a bit of contouring and I always use it on my neck too to blend it into the rest of my body which tends to usually be a little darker. Since I bought this I have used it basically everyday down to the last few specks. It is quite expensive for a bronzer but it doesn't compare to any others I have used in the past. The MUA bronzer in Bronzed Perfection is a really similar shade for a fraction of the price at £3 for a huge palette, and Bourjois's Delice de Poudre bronzing powder in the shade Tanned (52) is a mid-range alternative that is also extremely popular. Bronzer in the winter is definitely a less-is-more type product but it can work wonders in re-injecting some colour back into your skin. If, like me, you have spent most of summer wearing not much more than the bare necessities of make-up, unintentionally pushing eyeshadows and lipsticks to the back of the draw, a simple way of reintroducing some colour into your routine is natural shades of eyeshadows. Although browns, golds and coppers are shades that look good at any time of year, autumn is the season when you can get away with them, day or night. My autumn wardrobe is mostly made up of camel, blacks and burgundies which couldn't compliment these shades more. The one particular eyeshadow I always find myself going back to is the Revolution Eyeshadow in the shade Mountains of Gold which is a shimmery, pigmented bargain at only £1. I use a fine brush to create a fine line just above my eyeliner on my lid and another line beneath my bottom eyelashes. 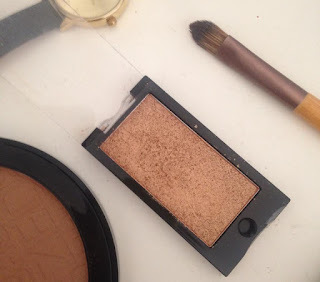 A bronzer and more subtle alternative is MAC's shade Amber Lights. If you're not as lazy as me and prefer a range of colours to blend, the Barry M Natural Glow Eye Shadow Palette has a great combination of earthy shades which are suitable for both daytime and evening looks. Autumn also bids a reluctant farewell to the sweet-shop pastels for nail varnish that are all the rage in summer, and welcomes in the deeper tones. Although I am enjoying giving my nails a break from being painted at the moment, I am also keen to pick up some autumnal shades. Plum and burgundy are my favourite shades this time of year as they are dark and mysterious whilst still being feminine, and you can't get much better or more choice than the Chanel Nail Colours, particularly in the shade Lotus Rouge and Accessoire. My high street alternative to Chanel would inevitably be Barry M, who have a huge range of colours for only about £4 and are a brand I have loyally worshiped for years. The shades Burgundy Crush and Raspberry are failsafe, and if you're feeling daring, Paprika is also a particularly autumnal shade. Nail care is also big at the moment so if you want to add a little luxury into your DIY manicure then the Nails Inc Nail Kale Superfood Base Coat is the key to stronger, healthier nails. I'm so pale all year, its rather depressing! The joys of living in scotland! I am excited for winter, where it is acceptable to be NC15 colour. Ha. Love the post though, you make me want to try a gradual tanner, and I need to get me some Nars Laguna!